When multi-tasking meets community sports, you get a cool hybrid that crosses skills from one program to another and, in Plumas County, the kids benefit big time. That’s the approach taken by Kyle Stone, recreation supervisor with the Central Plumas Recreation and Park District. He’s an active, organized guy, so he knows how to get things done. 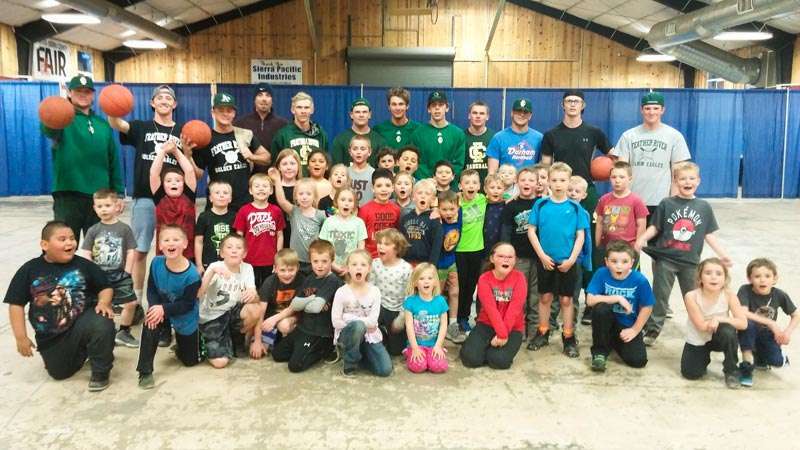 You heard that right — the college baseball players donated some of their free time to coach Plumas County kids in K-2 basketball and the pint-sized players had a terrific time learning from real athletes. “We had 46 participants in all and this program, which is designed to introduce young kids to basketball in a clinic format, was held at the Plumas-Sierra County Fairgrounds once a week for eight weeks,” Stone explained. Each week, a group of college baseball players, directed by FRC Assistant Coach Jason Gay volunteered their time to help teach the fundamentals of basketball and give kids an opportunity to have a fun, healthy activity to do in the winter. Stone shared his appreciation for the FRC players and management for various reasons, not the least of which was because of the time commitment and excellence they generously gave to the young players.